The following is a long-term review of a KTM Fogo 271 which at the time of writing, I have had the pleasure of owning for the last 16 months. Frame sizes :- 43cm, 48cm and 53cm. Bike colour :- Matt light grey, black + toxic orange. Tyres :- Schwalbe Nobby Nic 70-584 TL-easy, Snake skin, Apex. Weight 910g per tyre. the next bike was going to be, it needed to be 27.5” ‘plus’ size and just as the Macina Race, it also needed to have a good component specification. I was also keen to stay with both the KTM marque and Bosch drive unit system. After a bit of research, I opted for the KTM Fogo, which on paper exceeded my requirements by a significant margin and over time through use, has proved to be my perfect bike. The Magura Boltron T-20x110 front forks as fitted to the bike was an interesting one for me as I have read so many reports, both good and bad, which made me keen to own a bike that had them fitted just so that I could come to my own conclusion about them. I have also previously been asked privately about the forks and what I knew about them, so at least I finally got to discover for myself and can offer opinion accordingly, and not just based from hearsay. As it happened, this unknown gamble in respect of the front forks has proved to be worthwhile, and I really do love the compliant feel of them and for the most part they suit my riding style perfectly. They have also proved to be the most hassle-free and reliable front fork that I have ever owned. Before deciding upon this bike, I thoroughly researched the front forks and quickly came to the conclusion that any issues with them were simply down to poor set up and understanding of the fork by owners, which ultimately leads to seal failure. They possibly aren’t without fault though, and they certainly have weird handling characteristics, which can be a bit disconcerting if you didn’t know about it. Under braking the forks twist slightly which make the bike pull to the left. It is only really evident when riding on the road and once aware it, you kind of compensate in advance of it happening and soon became unaware of it. This also leads to one other issue though, which is the front brakes of the bike. The 180mm front disc is really a bit undersized for the bike, but I’m not convinced that the front fork could cope with a larger disc size. I do intend to try it sometime though, as it is about the only upgrade that after about 16 months of ownership of the bike, that I would like to make to it. The rear brake is more than up to the job, and I certainly have no complaints about it. Staying for a moment with the front forks, in use they have possibly had to put up with more abuse and adverse riding conditions than could perhaps be expected of any eMTB and have only given my concern once, which was when we had the bad snow conditions in February 2018. 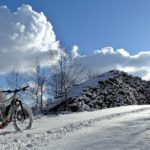 I went out for a night ride in what must have been the coldest conditions that I have ever ridden in, and after about two hours of being out, with the bike completely covered in solid ice, the forks suddenly compressed and would not return. Moisture on the stations had frozen and that was it. I had to return home, riding with them fully compressed. Come the morning, they were back to normal, and have never been a problem since. I had intended to rebuild them soon but cannot find either the oil capacity or air gap, so they are going back to Magura for the work. At £92.00 including return postage, it probably isn’t worth my while rebuilding them anyway. Taking a step back now to how the bike arrived… As with every bike that I have ever owned, I like to completely strip the bike down to component level, then re assemble studying parts and construction as I go. By doing so I gain a greater insight into the construction of a bike and can see what if anything in my opinion could or should be changed. Also, if anything fails whilst riding, having already stripped and rebuilt the bike, I have a head start on how to repair things. I get as much pleasure from working on bikes, as I do from riding them. feature. A small banana shaped cover which when removed, gives clear and easy access to main connectors of the Bosch CX drive unit. That in itself was a simple, but welcome change. KTM have also now chosen to use an additional two motor mounting points. This again impressed me, not because the standard three wasn’t enough, but more from the potential that it may prevent any motor creaking as the loading on the mounts is now more equal. Turning the frame upside down gave the biggest and most pleasant surprise from the point of view of working on a bike. KTM have chosen to redesign the cable routing and internal cast mounts to the frame. Routing cables, wiring, hydraulic brake and dropper post hose are now effortlessly easy and simple to do. I’m very impressed that such R&D has been put into this side of things, but I guess that it must save valuable seconds during the factory assembly stage. Speaking of cable and hose routing, I was also pleased to note that the frame entry points for routing are now fractionally larger as well. A lot of thought has gone into the production of this frame. Removal of the two tyres was next on the list and it was yet another pleasant surprise to see that the rims are tubeless ready, not just compatible. I’m all for saving a bit of time and money when setting them up to run tubeless. Something else that I have always done with a newly received bike, is to take the wheel set to a friend’s cycle shop, in order that he can digitally check spoke tension and wheel trueness. With the wheel collected, I then installed Stans valves and Effetto Mariposa CaffeLatex sealant. A sealant that I have no hesitation in using or recommending. Whilst in its knock down stage, I decided to take advantage of the situation, and fitted an AMS XL Honeycomb frame guard kit. It seemed silly to pass up the opportunity to test a kit and as expected it has excelled in use - I have been 100 percent happy with it. It was certainly easy enough to apply, although the frame colour doesn’t really mask any slight air bubbles very well. I also added 3M clear film to several areas of the frame and a couple of bits of Slapper tape to the chainstay area. The full bike/component specifications are detailed at the start but in the scheme of things, I have changed very little over my period of ownership. I have replaced the Intuvia display with Purion, fitted a Ragley Tracker saddle, Ritchey Foam grips, a 70mm Easton stem, and changed what I believe to be a KS LEV Integra dropper post, in favour of a Rockshox Reverb Stealth. These four listed items are just personal preference and nothing more. The dropper post is simply being changed as I have one that I removed from the Macina Race, so the rebadged KS can be squirreled away. I chose a 27.5” Plus size bike for two specific reasons. Firstly, I was keen to eliminate the need of owning both a hardtail and full suspension eMTB, figuring that Plus size would provide a good compromise in respect of ride comfort and then secondly, as I ride throughout the year and in all conditions and treat my bikes very much as tool to do a job, Plus size would provide superb low tyre pressure grip when riding over slippery roots and other wooded gnarly terrain, and alpine rock. I would also have the option should I so wish, of reducing tyre size in order to gain extra chainstay clearance for mud plugging. Despite claims by many as to the quality of performance of the original equipment Schwalbe Nobby Nic tyres, in the 16 months of owning and riding this bike and thousands of miles of off-road use, I have never found them to be an issue. They have also been extremely durable and it is only now that I have replaced them, using yet another Nobby Nic on the rear but this time fitting a Magic Mary to the front. I have also found the grip of Nobby Nics to be superb over slippery roots and rocks but they can, when getting worn, give a loose feel to the front. I don’t overly mind the feeling, but there is one very fast downhill section close to my house, where the front tyre didn’t track overly well during wet Winter months due to a significant depth of very mushed up leaves over a hard-packed clay surface. The Magic Mary has helped, but no tyre is ever going to tackle it competently and I certainly don’t see this as a fault of the Nobby Nic. I shall refit the old tyres again in the Spring as things begin to dry out. The Bosch CX drive unit has been well documented elsewhere, but as ever, I can’t really find a bad word to say about it. The one downside is the potential front sprocket wear over what could be expected by a larger size chain ring, but the original equipment EX1 sprockets seem to last very well. Even when riding in the Swiss Alps, I haven’t really required the additional torque that the CX has over the previous Performance Line drive unit but can never really work out whether the battery consumption is that much greater over the previous incarnation, as I tend to use lower power settings in conjunction with lower gears. I certainly prefer the cadence rate over say the Shimano system, which I found to not really suit my riding style. I’m still not really a fan of eMTB mode, but have just become used it now. I initially thought that it used a higher rate of battery consumption, but after completing side by side tests, this isn’t actually the case, and on occasions, it has actually proved to better than my own predicted power setting changes. There isn’t really anything else that I can currently think of to add to this. Moving on to the SRAM EX1 drivetrain. I must admit to not being a fan of SRAM components, preferring Shimano, and initially I had thought of removing EX1 from the bike, and fitting a Shimano XT set up instead. As this bike was as much about trying different things out, I stuck with the OE set up, and have mixed thoughts about it. Starting with the negatives, cost is possibly the biggest, and certainly not one that is justified. Next up is that it is a system that requires great care setting up and from my experience, quite tricky to keep running correctly. The issue seems to be that the derailleur cage is easily bent and care has to be taken. My biggest issue with it has been the open holes on the rear cassette, which are magnet for mud and other debris and if anything is likely to upset smooth gear selection, then this is it. My next complaint is that it eats jockey wheel bearings. The teeth remain fine, but the bearings wear out very quickly. Finally, my last complaint is that the jump between gear ratios is too great and I often find myself wanting a gear between each selection. I’m more of a fan of ten-speed cassettes. Onto the positives of the system, when set up correctly it is exceptionally smooth in operation and gear selection can be made at very inappropriate times, such as when under load whilst hill climbing with no hint of complaint such as grinding or any other unwanted noise or strain. Other than the jockey wheel bearings, the system has proved to be exceptionally durable, and even after thousands of miles of use, the cassette doesn’t seem to be showing signs of wear. The EX1 chain and front sprocket also seem to wear very well and I certainly have no complaints in that respect. Moving on to the XT brakes, these have proved as expected - to be 100% reliable but the 180mm brake rotor size back and front, could only ever be considered adequate for the job. The front could really benefit from a 200mm rotor, but I suspect that the front forks would struggle to cope. In use this bike has proved to be brilliant fun, and is certainly a massive leap forward in respect of handling and durability when compared to my old Macina hardtail. Clearly the new frame has much to do with this and with the combination of the 2.8 plus size, the ride is so much more stable and forgiving. Through choice, I’d certainly never go back to a narrower tyre section size. Plus size suits hardtail eMTB's so well. 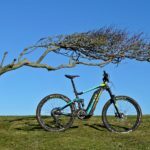 The times that I have wanted or wished to be riding a full suspension eMTB have also been very limited, which in itself speaks very highly of Plus size. The bike has proved equally at home riding my local woodlands exploring at low speed, as it has when riding in the Swiss Alps. 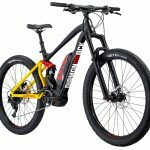 I have yet to see anything else on the market in respect of hardtails, that could tempt me away from this bike but that has more to do with me preferring a semi integrated battery rather than fully integrated, and having two batteries, I wouldn’t want to be swapping and starting again anyway. 203mm on the front wont be a problem as it is just an adaptor so the caliper would be 23mm taller on the front fork mount so would not be a problem. as for the rear you might have a clearance problem with the caliper fouling the frame but only way is to try it and see. the main reason i have 203mm front and rear is to save on disc pads as heat kills even sinterd pads in no time. 180mm is the maximum that the Boltron forks could take, simply because there is too much flex in them already. The good news is that a friend come bike shop owner has offered me a 'no brainer' deal on a set of superb MRP Ribbon coil forks. I already have a few other friends that use them, and have yet to hear one bad thing about them. On the plus side, changing them gives me an increase in fork travel from 120mm to 150mm, the distance from the centre of wheel spindle to the bottom of the steerer tube is just 4mm longer than the Boltron set up, so I'm not going to worry about that, and I can then run a 203mm front disc quite easily, and also fit something that I have long missed with the Boltron set up, my RapidRacer Neoguard. I've really missed that, not that spray has weirdly ever been an issue with the Boltron set up. Brilliant review Eddie, many thanks- as a Lycan owner particularly interested in the EX1 system and this wear in the jockey wheels problem? I've just upgraded my front brake to 203mm with the adapter, the 180 and pads can be rear brake spares now, but running 2.35" Nobby Nics I'll need to watch for traction when on the levers!! Eddie is like the lizard thing on the WE-FLIP ad, thorough. Sure does a very nice in depth review of his bikes. And I forgot to say again , fantastic composition on taking pics. The boy ( well like me not so much boy now) certainly has an eye for detail. I always enjoy reading/looking at Ed's posts. Thanks for the nicely written review. Super photos! All in all for me the above 2 components I would not rush out to use again . Thank you for such a high-quality review. It will come in handy when choosing my bike.